Hidden inside a 1950s ranch-style house, the Ideas in Food lab works with some of America's boldest chefs. Here, a look inside its problem-solving process. The suburban home of Alex Talbot and Aki Kamozawa, located in Levittown, Pennsylvania, doesn't look like a world-famous food lab, the secret weapon of stymied chefs. But then the Institute for Advanced Study in Princeton, New Jersey, looks just like any other office building. Behind the garage door of this 1950s ranch home is a state-of-the-art facility equipped with liquid nitrogen, rotary evaporators, Pacojet micro-blenders and a whole library of stabilizing powders. Countless modernist chefs have communed with Alex and Aki, including New York City's Wylie Dufresne and Charleston, South Carolina's Sean Brock. The duo's acolytes aren't limited to chefs: Alex and Aki host "bespoke workshops" in the lab, starting at $1,000 a day, for everyone from Philadelphia foodies to corporations like Frito-Lay. Unilever even invited them to the company's New Jersey headquarters to lecture on creativity and the future of food. Like the Koch brothers and Black Sabbath, their influence is all-pervasive and invisible. Alex and Aki started their careers in a typical way: Both were line cooks in Boston's Clio restaurant when they met in 1997. By 2000, they were married and working together in restaurants all along the northeast coast, always talking and thinking about food. The two have a powerful intellectual synergy, and that "ongoing conversation," as Alex calls it, turned into the Ideas in Food blog in 2004. "The things we were excited about—stabilizers, extraction, just ways to make food better—were things a lot of young chefs were interested in," Alex says. The couple were soon in regular contact with ambitious young cooks around the country. "We were all playing in the same sandbox," Alex explains. Since then, Alex and Aki have done everything from writing a column for Popular Science to appearing as guest chefs on the Holland America cruise line. They have a way of popping up everywhere. A few months ago, I organized a benefit dinner at 42 restaurant, in White Plains, New York, and there was Alex, helping chef Anthony Goncalves make seaweed spaghetti. Two weeks later, I was in San Antonio, visiting Tim Rattray, a brilliant, obscure barbecue chef; a flyer for an Ideas in Food dinner was in the window. 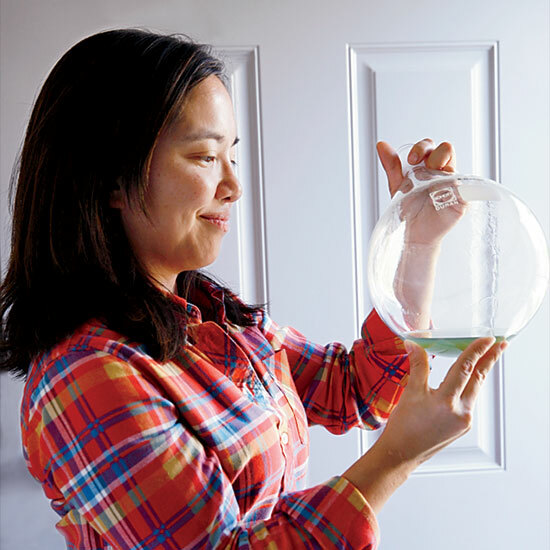 On the day I visited their Levittown food lab, Alex and Aki were experimenting with a rotary evaporator—basically a big salad spinner that uses vacuum pressure to create ultra-pure distillates and extracts—to remove the alcohol from various spirits. There was a bourbon syrup that was all wood and vanilla and smoke, which Alex subsequently caramelized; a glowing green Chartreuse essence that looked like Kryptonite; and a ketchup-like sauce extracted from Bloody Marys. On a counter were all the tools and ingredients for the next project—preserved-lemon pasta. One of Alex and Aki's favorite new toys is an Arcobaleno pasta extruder; they've been making all types of intensely flavored pastas, using unusual ingredients like kimchi, lobster roe and sea urchin. Today's process isn't very complicated; it basically amounts to putting the lemons in a blender, straining the resulting goop and mixing it with semolina flour, baking soda and wheat gluten (for extra tensile strength). The result is a thick, ropy, toothsome pasta, bright yellow and with a deep, lasting lemon flavor. I had my own reason for visiting the Ideas in Food lab. I was organizing a big steak event for a few hundred people in Texas; it would feature, at its center, one of the most voluptuously marbled steaks in the world, an all-Wagyu from California's Flannery Beef. This kind of steak doesn't cook like a supermarket rib eye, as anyone who has ever started a grease fire grilling Kobe beef will tell you. The steaks were laid out, each in their vacuum-sealed bag. The issue, I told Alex and Aki, was that these steaks had so much fat that they tended to explode like magnesium grenades when put directly over the fire, but that they needed to be put over the fire, because anything that rich and fatty should be firmed up and rendered down. Plus, the steaks are so soft that you can't tell by feel if they are done. And what's more, even when they are done to a perfect medium-rare (a hot red center), they still seem like tartare—soft and mushy. Immediately, Alex and Aki's ideas started flowing: "Here's what I think we should do," Aki told me. "Let's cut the steak up into thick pieces, thick enough that they cook like steaks. And let's start out by seeing how they cook." This meant using multiple methods, starting with a hot cast-iron pan. "OK," I said, getting into the spirit of the thing. "Let's cook some in the pan, and some over a live wood fire, and some in the pizza oven." Over the next four hours, we did everything imaginable to the steak, from suspending it on skewers precariously held aloft by the tower of a Bundt pan to blast-chilling it in an ultra-cold freezer and then throwing it over the grill. "Freeze meat! The whole point of great meat is that you don't freeze it!" I yelped. "Why is it bad?" Alex asked me, earnestly. "Because," I told him somewhat pedantically, "the water as it freezes creates ice crystals that shatter and mangle the cell walls." "And why do you dry-age meat?" "Um…so that the enzymes will decay and, uh, shatter and mangle the cell walls." "So that's what we're going to do. And it's going to take us two hours, not four weeks." Dumbfounded, I followed along; elated, I saw that he was right. The freezing, by breaking down the cell walls, duplicated some of the best effects of dry-aging, tenderizing the beef and releasing cellular material that gave it a pleasingly mineral taste. While I typically take a minimalist approach to seasoning steak—kosher salt and ground pepper, nothing else—Alex insisted that we try rubbing the steaks with bone marrow. Bone marrow? The whole problem was that it was too fatty! Why would I want to slather it with more fat? Alex played coy, but promised it would be delicious. "Alex really loves bone marrow," Aki told me. "He always wants to put it on steak." This seemed counterintuitive, but then it was for this very kind of unconventional thinking that I'd sought out these two to begin with. The whole afternoon was like that. We tried every method with two pieces of steak, one cooked medium-rare and one cooked medium. We topped some with marrow, others with a butter made from pungent St. Albray cheese and tried others straight-up. We took copious notes. We conferred. We tried the best versions twice. For the record, the perfect method for cooking full-Wagyu steaks is to wood-roast them suspended over a Bundt pan, or something like it, frozen and skewered, so the meat cooks on all sides, crust up. You have to cook it long enough, and hot enough, to ruin an ordinary steak; otherwise the center stays soft and flaccid, rare in texture even after it loses its red color. And, yes, you then rest the meat in onion-scented marrow, which, it turns out, does a lot more than just layering on extra fat; like everything Alex and Aki do to food, its purpose is to add extra flavor—in this case, umami. In the end, the marrow makes the steak taste even more like itself. Having now made the pilgrimage to Levittown with my own problem, it's easy to see why chefs are so drawn to Alex and Aki. Ideas in Food isn't just a consulting group—it's a fusion reactor of ideas. I've probably spent thousands of hours eating, writing and thinking about steak. It's my favorite food. But, by the end of our session, I knew approximately 60 percent more about steak than when I had started, and had about 500 percent more fun in the process than I would've had in an ordinary restaurant kitchen. In one afternoon, my whole perspective on my favorite food had changed. That is what I call genius. New York City writer Josh Ozersky is a regular contributor to foodandwine.com and created the Meatopia festival.